Accuracy and consistency are essential to success in manufacturing, and the technology of precision measurement is fully explained and illustrated in this important book for both apprentice and practicing engineers. • Provides illustrations of the devices throughout with descriptions of how they are used in industry. 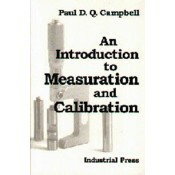 • Offers a vast amount of new material that can be applied to virtually any imaginable measurement or calibration task. This is a Print-On-Demand book and is printed upon receipt of your order. It is not returnable except for product defects. Delivery will take approximately 10 - 14 days.